A string of blockbuster deals to kick off 2013 invigorated the merger-and-acquisition business but didn’t convince deal makers that a global revival is under way, as activity around the globe remains muted and the U.S. market still faces challenges. In addition to the Dell bids, three other deals topped $15 billion, including the $23.6 billion acquisition of H.J. Heinz Co. HNZ +0.06% by Warren Buffett’s Berkshire Hathaway Inc., BRKB -0.70% and private-equity firm 3G Capital. 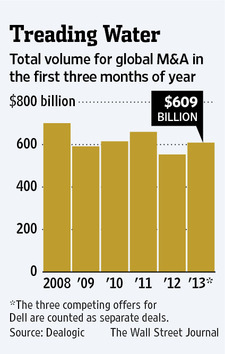 In all of 2012, only four deals topped $20 billion. Particularly in the U.S., the busy quarter provided optimism. Readily available debt means both corporations and private-equity firms can pursue bigger targets. Rising stock prices are motivating boards and chief executives to consider selling. Activist investors have become a bigger presence prodding companies into action, often in the form of asset sales. Factors driving up M&A activity are being offset by the same speed bumps that have slowed deal making since the financial crisis: the European debt crisis, still-high U.S. unemployment and a lack of confidence among CEOs and directors to push for big deals. Meantime, Cyprus’s financial bailout ignited new worries. Deal makers said CEOs and boards are looking seriously at bigger, more aggressive deals than in recent years but don’t yet have the confidence to move forward. For instance, the Heinz deal, one of the biggest food acquisitions ever, is prompting potential buyers and sellers to take a new look at that sector, deal makers said. Deal makers said that firms abroad are drawn to American companies as the U.S. proves increasingly stable relative to other markets. M&A was down 4% in Europe from a year ago, down 22% for Asia-Pacifc and remained flat in emerging markets.The U.S. market, “is big, it’s stable, it’s safer and it’s got more predictable rules and regulations,” said Steve Baronoff, global M&A chairman for Bank of America Merrill Lynch. Paul Parker, Barclays head of global corporate finance and M&A, said conditions are ripe for business to pick up, but a return to normal deal activity remains several years away. He predicts M&A activity will climb about 10% this year compared to 2012. “Confidence is lower, and we’re still not far enough away from the financial crisis,” he said. Private-equity deals made up about 16% of the overall deals market. with volume nearly tripling from a year ago to $96.6 billion, driven largely by the Blackstone and Silver Lake bids for Dell for a combined $46 billion. Buyout activity fell 45% in Europe to $6.1 billion. J.P. Morgan moved into the top spot in Dealogic’s ranking of deal advisers, with $208.6 billion of deals globally, followed by last year’s No. 1, Goldman Sachs, with $205.7 billion and Morgan Stanley MS -1.48% with $162.1 billion. Barclays BARC.LN +0.33% PLC and Bank of America BAC -0.25% rounded out the top five. Hogan Lovells LLP took the top spot among law firms, followed by Davis Polk & Wardwell LLP; Weil, Gotshal & Manges LLP; Wachtell, Lipton, Rosen & Katz LLP and O’Melveny & Meyers LLP. via Busy M&A Quarter Doesn’t Persuade Skeptics – WSJ.com.